AUSTRALIA WINS THE RUGBY WORLD CUP! "Today, on the last day of the half-term, was an exciting day for four special teams by reaching the semi-final: Australia v Scotland and Japan v Fiji. Both games were very close but Australia and Japan made it to the final. Again, a very close match but my team, Australia, under head coach Mr Williams, eventually won by a score of 24-7. Thank you to Mr Jones for organising the tournament during this half term, everyone have enjoyed immensely!" » Year 6 pupils help load the van with bags that were contributed by parents of the school. Thank you all for your contributions - the clothes, shoes etc are now being sent to the company and the school will receive £500 for every tonne collected. "I like going to the Town Library every week with my Mum and Betsan. During the summer holidays we were given prizes for borrowing books! I was given stickers and a wrist band! My favourite was a yo-yo. There is a lot of choice in the Town Library - especially Roald Dahl's books - he's my favourite!" "Having been elected Chairperson for this year's school council, I am really looking forward to representing my class and listening to other children's ideas of how we can make Ysgol Gymraeg a better place for pupils." "Today we walked over to the Leisure Centre to take part in Sbri Di-Ri. Mr Urdd was there celebrating his birthday. We sang many songs, such as ‘Hei Mr Urdd’, ‘Sali Mali’ and ‘Jemeima Mop’, and danced a lot. Sali Mali and Jac-Do were there, as well as a character called ‘Dewin’. We got stickers to wear with the letter ‘D’ for Dewin on them. Sali Mali had been very busy making jelly and a birthday cake for Mr Urdd. Sbri Di-Ri was a lot of fun, especially singing ‘Hei Mr Urdd’!" "We celebrated National T.Llew Jones Day at school today. October 11th is an important day as it was the birth day of T.Llew Jones. In Year 6 we read a description of the character Alff Boswell from the book ‘Tân ar y Comin’ and answered some comprehension questions. Pupils from other year groups also did activities based on remembering T.Llew Jones - such as creating fact files about him, emulating the covers of his books and reading his poetry. I have read several of T.Llew Jones’ books and my favourite is ‘Dirgelwch yr Ogof’. I also love the film ‘Tân ar y Comin’ and have watched it several times. It is important to remember T.Llew Jones every year as he is a true legend to Welsh children." Over eighty pupils from the school took part in the Aberystwyth area cross country competition which was held at the Vicarage Fields. 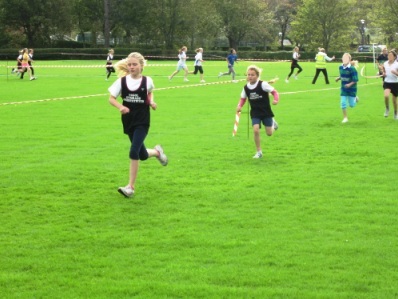 The races were held for boys and girls from year 3 to 6, with over 600 children from the area competing altogether. Congratulations to all that took part. "Everyone in Year 3 came to school dressed in very colourful clothes today as our country was Peru. Rhys Davies came to teach us Spanish - I can count up to ten in Spanish! Also, Mr Watkins and his wife brought an Alpaca to show us. It was a quiet, shy and friendly animal. It felt quite strange to see an Alpaca on the school field!" "The National Library was full of information. We looked at old maps of Wales and Aberystwyth in particular, as well as seeing old photographs of our local area which dated back around a century and a half! The tour of the Library was also fun, especially the special shelves which can be moved by turning a wheel! Thank you to Rhodri and Owen for making the visit so enjoyable."